Abaco Barb Horses are from the Great Abaco Island in the Bahamas. They are believed to be descended from horses from more than a dozen shipwrecks during the Spanish colonization of the Americas and the Caribbean during the 15th and 16th centuries. Some horse breed historians also believe that the Barb horse breed originated in northern Africa during the 8th century and Abaco Barbs are often commonly confused with Arabian breeds. Due to their extreme isolation on the Great Abaco Island, their bloodlines remained relatively pure, making them an important genetic link as the first Iberian horses to reach the New World. These horses brought genetics that were present during the Golden Age of Spain at the time the New World was being settled. 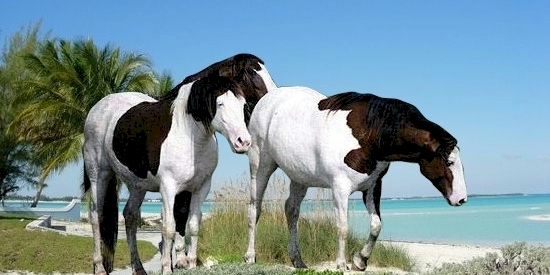 Abaco Barb Horses once numbered over 200 and lived wild on the island. But most of them died. Several died when attempts to captivate them failed. The paving of new roads through the horse’s territories caused conflicts between horses and men and many horses were killed. And large numbers of wild feral dog attacked and killed many foals. Attempts were made to intervene in the Abaco Barb’s extinction and three surviving horses were brought to a farm near Treasure Cay in 1992. The herd increased to 35 at that time, however, over half the horses died during their time there. No foals of the Abaco Barb were born since 1998. Scientists speculate that inbreeding in captivity may have had a significant impact on the breed’s demise. By early 2010, the herd had diminished to six. By August 2013, only one horse remained: one mare living inside the preserve. In February 2014, it was announced that eggs would be harvested from that last mare, but unfortunately the mare died in a fence accident. It is thought that perhaps a handful of the Abaco Barbed horses may still exist in the wild, somewhere still on the Island, as some stallions escaped during the initial attempts to contain and preserve the herd. Only time will tell if the Abaco remains.